One of my co-workers gave me a coupon for REI, so on Saturday I took the bus to the nearest store and browsed for a while. I picked up a few things to use on my bike, so that was nice. It happened to be near a grocery store, so I managed to replenish several depleted items while I was out. Now that my main crop tomatoes are ripening, I decided to devote Sunday to making sauce. I started in the morning by picking all the ripe tomatoes I could find. I chopped them and filled the largest pot I own, an 8-quart pressure cooker, completely to the brim. By lunchtime they were ready to run through the strainer to remove all the skin and seeds. Then I put them back on the stove to simmer until they evaporated down to something that could be considered sauce rather than juice. By supper, I wound up with just over 5 cups of sauce. I have it on the stove processing now. It saves on freezer space, which is currently at a premium, but it really takes up my whole day. Wow! 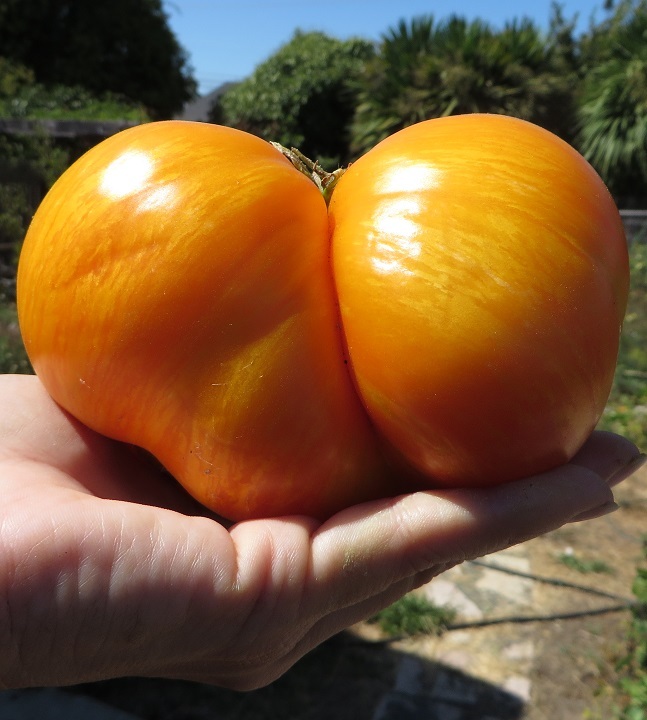 What a gorgeous tomato! Your sauce made the best pizza ever that we got to eat last summer when we were kitchen-less. It is a lot of work, though. That's not even counting all the work you spent growing, watering, and weeding them. Nothing else tastes quite as fine.